In the years since I began researching the influence of synesthesia on mixed media artworks, it’s been somewhat disheartening to observe how “total artworks” dealing in sensory unity are still perceived: as a kind of desperate gimmick intended to divert attention away from a poverty of substance, a luminous smokescreen to blind audiences to the existence of half-formed concepts. Mind you, this is definitely true in certain circumstances, and I grow weary as anyone else of hearing about real-time events that are “synesthetic” simply because both sights and sounds are coming at the observer with a similar level of intensity. Yet this is not the whole story of artwork that aims at stimulating the whole sensory apparatus, and moreover that ‘whole story’ goes back much further than the electronic age, which is too often the sole focus of this research. It is reassuring, in a way, to see more documentation appearing which proves the synesthetic tradition in the arts (particularly the “avant-garde” eruption of the early 20th century) is just that: not a sudden shudder of novelty that, like so much other contemporary art, owes itself to the unique circumstances of digital networked life, but a story that has unfolded synchronously with the story of technological development “full stop”. One such piece of documentation, Fulvio Piccinino’s 2014 bilingual opus La Miscelazione Futurista / Futurist Mixology, provides a potent object lesson of modern sensory biases with regards to artwork, i.e. the “visuo-centrism” which tends to see the “chemical senses” of taste and scent as things to be overcome rather than further evolved through imaginative aesthetic exercises. The book is definitely a welcome oddity, being thus far the only book I’ve encountered which functions as an avant-garde art history text and as a barman’s guide to drink mixing (the “publisher” is actually the Cocchi winery, who none-too-subtly sneak some choice product placement into the book’s color plates). Though there is an engrossing section dedicated to drink recipes, the book allocates most of its space to the story of how these drinks (known locally as polibibite) were an integral part of Italian Futurism, a movement that provides perhaps the most seminal example of “art-as-provocation” from the 20th century. Once Futurism’s headstrong attitudes had been tested by the century’s most turbulent crises (i.e., both World War I and the Great Depression), it survived to be perhaps the first serious art movement to glorify the aesthetics of machines and other technological extensions of man, seeing continual self-intensification as both a desirable end and an ecstatic process in and of itself. As the author himself recognizes, the Futurist dalliance with food and drink remains one of the least internationally recognized parts of their overall campaign for a tabula rasa of new possibilities (whose lack of self-imposed limitations was summed up by Marinetti’s rallying cry of “let’s murder the moonlight”). 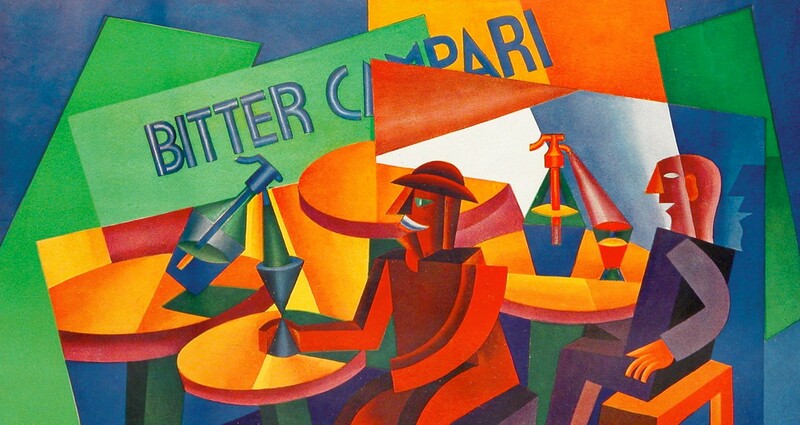 In spite of some major exceptions, like the fact that Futurist graphic designer Fortunato Depero’s 1932 bottle design for Campari Soda is still in production 85 years later, this remains a more or less clandestine history outside of the Futurists’ homeland. Piccinino’s great accomplishment here is to show why Futurist recalibrations of Italian drinking culture and cuisine have remained occluded, and at the same time to argue that they crystallize the “will-to-dynamism” of the Futurist artists every bit as much as the more well-known manifestoes, poems, paintings, theatrical presentations and architectural anomalies. When looking back on the war-glorifying and anti-Romantic language of the Futurists’ foundational manifestos (the first of these being printed in Le Figaro in 1909), it is fascinating that they managed to eventually succeed in altering the definition of “bad” art: in classical artwork it was ugliness which gave an artwork that designation, and in the new avant-gardes it was when passatismo or stubborn reliance on tradition was seen as the guide to be followed rather than raw imagination. The antipassatismo or anti-traditional attitude behind Futurism was never something that it could claim sole bragging rights to: in fact, Renato Poggioli’s famous Theory of The Avant-Garde essentially identifies that tendency as one which was common to all historical “avant-gardes,” even though it was in Italian Futurism where it was most “authentically revealed” (i.e. “the futurist moment belongs to all the avant-gardes and not only to the one named for it”)[i]. The two main animating tendencies of Futurism — a sort of constructive agonism paired with destructive nihilism — were memorably critiqued by Poggioli as a sort of “positive defeatism,” a campaign to “make dungheaps of themselves for the fertilizing of conquered lands, or mountains of corpses over which a new generation may in turn scale the besieged fortress”. [ii] However, despite the clear disdain embedded in this commentary, artworks born from that apparently suicidal strategy have paradoxically helped to vitalize successive generations of antipassatismo, if not aesthetic tendencies oriented towards completely different goals. For example, the tin postcards designed by the Futurists to lend an agonistic edge to postal communication (and which were themselves a spin-off of their litolatte or metal-bound books) were a prototype for much of the work produced by the international Mail Art movement that burgeoned in the 1970s and 1980s. The sonic aetshetics expounded in the Art of Noises manifesto of 1913 were recuperated, either knowingly or unknowingly, into thousands of later examples of musique concrète and “noise-as-music.” The aviation-worshipping style of painting known as aeropittura was an early trailblazer of distorted perspectives conferring the illusion of movement. Those who delve into Piccinino’s book solely to attain a more complete view of the Italian Futurist program won’t be disappointed by the copious amount of obscure information on display here, particularly that which shows how Futurist engagement with drinking culture often contradicted the larger program of antipassatismo (e.g. unlike other more clearly provocative actions, their experimentation with mixed drinks featured no “radical break with the past”). To wit: the same movement that comically declared an anti-traditionalist “war on pasta,” to predictably apoplectic reactions from the public, also endorsed the polibibite as a kind of nationalist alternative to encroachment by foreign liqeurs and spirits. More interesting than this, though, are the descriptions of the “total environments” that the Futurists set up to make the ephemeral realms of cuisine, drink, and scent an equal partner with the more congealed energy of sculptural and architectural elements. For example, the Futurists operated a restaurant called the Holy Palate in Turin, whose aluminum walls and then-radical decorative austerity made it seem as if “an aeroplane or submarine reconstructed in the very heart of Turin had suddenly landed or surfaced out of nowhere”. Elsewhere, Giacomo Balla’s design for the Roman bar Bal Tik Tak took a different approach, though one still animated by the Futurists’ love of continual movement and abhorrence of anything static: the effect of light shining on specially prepared ceiling fabrics could arguably be seen as a prototypical example of “Op” art or light painting. A good deal of recent study on synesthetic art has focused on works which replicate that neurological condition’s sense of stripping away metaphorical content and suggesting direct equivalencies: in other words, a kind of direct translation in which ‘x’ sound is no longer like ‘y’ color, but is ‘y’ color, and the two are perceived more or less simultaneously. Readers interested in this form of inquiry should be warned that La Miscelazione Futurista does not touch upon it all. However, equally as important as this mutual arising of sensations is the phenomenon of artists translating a piece from form ‘x’ to form ‘y’ after an initial flash of inspiration. Piccinino’s book is an impressive catalog of such instances, e.g. the aeropittura artist Prampolini being driven to the easel by “the purple and gold fish soup of Capri accompanied by the cool local wine,” or Marinetti’s “aeropoem” Golfo di la Spezia being the end result of an encounter with the Futurist “paradise in the mouth” broth, itself featuring rose petals as its signature ingredient. In all cases, the Futurist flirtations with drinking and cuisine were not undertaken in order to communicate something other than what they expressed in their works of audio-visual works, but to reinforce and expand upon the sense of relentless dynamism and surprise that those more widely appreciated works had already established. Having done this, Piccinino shows that the distrust of artworks which have as their aim the satiation of the ‘chemical senses’ is hardly unique to our own time, while also noting that the challenge of altering the public’s gastronomical interests can be, paradoxically, much more difficult than making the same public accept radical developments in other art forms. He is careful to note that “Marinetti’s project to overturn cuisine and the world of drinking was greeted by his old henchmen as a kind of a farce, a project far less important than the previous ones in which the Futurists had excelled in much more noble arts”. While this was probably due, as Piccinino repeatedly emphasizes, to the fact that neither Marinetti nor any of his fellow travelers were trained as chefs or barmen (Marinetti personally claimed his past military experience prevented him somehow from donning the “uniform” of the cook), I would argue that it again returns to the negative bias against the ephemeral qualities of food and drink relative to the more supposedly enduring qualities of other art forms. Looking at the compositional daring and occasional recklessness which characterizes the recipes for the 19 polibibite drafted up by the Futurists, this state of affairs becomes a little more tragic. Readers will be struck by a feeling that the individual authors’ instructions for the interplay of light with the mixed ingredients, or the evocative qualities of names like “Coppa di Brividi [cup of shivers]” and “Guerra in Letto [war in bed]” take into account the total environment more so than plenty of artworks that are created in those more enduring forms. Once again, an act of groundbreaking also accompanies these attempts to transform the drinking and dining atmosphere from one of resigned calm to one of surprise and chance encounters, while prefiguring those intermedia and conceptual art pieces which aim to provide lasting impressions regardless of the artist’s choice of raw materials, or whether or not the circumstances surrounding the initial encounter with the work can be repeated. Perhaps this is attitude of “new expression at all costs” is the greatest takeaway from this book (whose historical and modernized polibibite recipes, it has to be said, won’t be easy for novice barmen to produce, either in spite of or because of their singular alchemy having been stumbled upon by non-specialists). 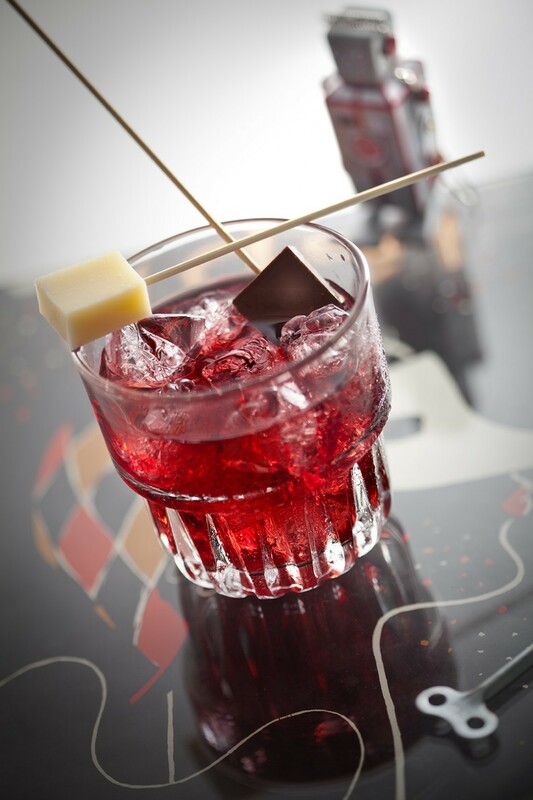 The drinks featured in Futurist Mixology, whether they are taken as a distillation of a more sweeping project or simply enjoyed on their own merits, hint at an approach to art that sees endless regenerative potential as being the sine qua non for going public with any creative idea. [i] Poggioli, Renato. Theory of the Avant-Garde. Translated by Gerald Fitzgerald, Belknap Press / Harvard University Press, 1968.